Rita Briner from Quilter's Station is one of the most gracious hostesses you'll ever meet. She started Primitives of the Midwest two years ago and asked me, along with many other teachers, to create some projects others could have fun making! That's about all she had to say to us. We hopped on a plane and the rest is history! This years event almost doubled last year's retreat and it sounds like many more will be coming next year. Everyone has a great time. Rita Briner and me in front of Quilter's Station. We all start to look a like wearing our t-shirts that are available. These gals design the T-shirts and each year they are different. What is really nice is that you don't have to bring lots of clothes to wear and it gives you more room in your suitcase for all the wonderful goodies you find there. I haven't gotten that under control yet. Big Bertha always costs me money at the check in counter at the airport because she weighs so much! Laura, me and Donna standing in front of the Honey Bee's and Butterflies. The wall hanging that was made at PMW. Honey Bee's and Butterflies was a wallhanging I made for this event. It's made out of homespuns and wool for the basket handle and flowers. The flowers can be cut free hand! (However, the pattern will have templates included) Hmmm, I wonder if Rita has any kits left? Amy, me and Sue posing after the nine patch qeese class. Be sure to ask the girls how easy this one is. They practically had the whole top made. back from l to r - Donna, Sharon, Nancy, Sue, Cathy, Sandy, Sharlyn. Front l to r Kendee, me, Mary. The girls in the Wool table rug class had the best time free handing all the pieces they needed to make their rug. A lot of them made the long version of this, but some needed to have a different size. Everyone did a great job. The 3 pictures below are the ones I made for the class......after that you will see pictures of the table rugs the girls made. A mile long table runner made out of wool was the project for this class.....but other sizes were offered as well. The next two pictures will show you two other sizes. Not everyone made the same sized rug. Long and skinny is fine if you have the space, but sometimes you just need a square shape. Also, check out the fact that the background is two different fabrics. Nancy needed an extra large table rug. It turned out really fun. Normally one to cut from templates, Nancy free handed each of these pieces. Enlarge the picture to see how she did the end pieces. How fun! This July (2006) I was invited to the Brandon Florida Quilt Guild to teach an all day class and speak at their meeting. Only a two hour drive from home I packed up early on Saturday morning and arrived in Brandon to find 19 gals ready to get to work. I had them precut their pieces - using templates no less! I know, I know, no one likes templates, but like I told them, make friends with templates; you never know when you need one! (Scrappy is done best this way!) They had read all the instructions in the pattern and were ready for a fun day of just sewing! They had chosen SHOTGUN WEDDING as their project and I was very impressed with their results. I couldn't wait to share pictures with all of you. I drove back down to Brandon Monday evening to speak at their meeting and I forgot to take my camera. I was totally surprised to see how many of these gals completed their tops. I'm hoping many of them send pictures to share in the parlor room. Raedene already has and I've posted her quilt top there for you to see. Sarah sent me this lovely version of her Shotgun Wedding. She told me it was a Romantic Shotgun Wedding! Thanks Sarah. The following two pictures were also sent by Sarah. These pictures were taken at the Monday night Show 'n tell meeting. Guess who forgot her camera that night?! This is the block everyone will be making for this special "block party" for cancer. The quilt blocks will be put together on point, as you see here. Everyone that signs up will receive an information packet in the mail. Everyone's block that is returned to me will be photographed and posted as before. Scraps of Hope measures 92 inches square. Blocks were sewn together on point. Participants who made the blocks were: Annette Austin, Cheryle Harte, Cheryl Mills, Raine Cavallo, Barbara Budelman, JoAnn Depeaux, Katrina O'Rourke, Cindy Herd, Jeannette Morrison, Gaye Smith, Joan Coyle, Lynda Hall, Cheryl Knapp, Cathy Hansen, Maggie Honeyman, Lynn Ray, Linda Orizondo, Alice Shaw, Kelly Van Deer, Carol Edwards, Jeanne Wortham, Dora Tomczak, Donna Phillips, Carol Crago, Cathi Gainey, Kathy Savage, Joyce Ann Lippet, Sandy Berger, Nancy Tester. Scraps of Hope back.....fabric donated by Jeanne Wortham, Melbourne, Fla. Back made by Donna Phillips, Orlando, Fla.
Memories and Miracles is 78 inches square. Blocks were put together straight with sashing in between. Participants who made the blocks are: Liz Stanis, Minty Brewer, Barb Cribb, Dawn Denman, Debbie Manceni, Tina Weigner, Jeri Wolfe, Jason Watson, Tina Porter, Diana Ward, Claire Birch, Jill Cardamone, Marilyn Craid, Chelsie Hall, Kathy Savage, Eleanor Yost, Katrina O'Rourke, Jill, Cindy Rohr, Sally Frye, Annette Austin, Mary Lou Ward. The backing material for this quilt was donated and made by Lynda Hall. The blocks were sewn together by Lynda Hall. CROSSROADS TO A CURE is 83 x 87 inches. The blocks were sewn together on point. Machine Quilter - Pam Post from south Fla. PIECES OF OUR HEARTS measures 75 x 91. The blocks were sewn together on point. The backing material was donated and made by Lynn Ray from Gurnee, Illinois. What a super back you made Lynn......Thank you so much! 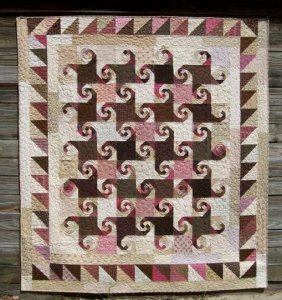 The blocks for this quilt were sewn together at an all day sew-in by Carol Crago, Donna Phillips, Jeanne Wortham and Lynda Hall. After the last group projects for Quilts for a Cause, Inc. they asked me to design a quilt pattern for them that they could market. So, Twist 'n Shout was designed. Carol Crago and I worked on making the quilt and it was then quilted and shipped to Arizona where Quilt For a Cause, Inc. took over, wrote the instructions and is now selling it from their site. If you haven't gotten a copy, I hope you'll do so......the proceeds go to women's cancer. Visit their site and order your copy today. Thanks! Decorating for the holidays is always fun at my house. The bigger the holiday or season, the more stuff you'll see. The fall, especially, is a favorite for me. There are so many talented people among us that make the most fun dolls and, of course, my all time favorites are the ones that look the most pitiful. They usually end up coming to live with us. The table rugs or quilt items you see are made by me. I hope you enjoy the pictures you'll see below. QUESTION: From a shop owner who asked "Why do you fold your patterns in half? If the name of the pattern wasn't so big you could put the picture on half a page. ANSWER:As a quilter, I got frustrated with other patterns that didn't provide a large enough picture to see any detail. So, when I started Primitive Pieces by Lynda I wanted a larger visual for the QUILTER so that once you get it home you have a bigger picture to study. I'm proud of this distinction in my patterns and hope other pattern company's will soon follow.Changes have been made to the patterns I carry. They are now opened up with a full picture for you to view on the cover. QUESTION: Why do you use brown paper? ANSWER: Primitive Pieces by Lynda, as the title suggests, is a more primitive style. Dark and dirty as they say. I have experimented on lighter paper and the primitive look just doesn't happen. 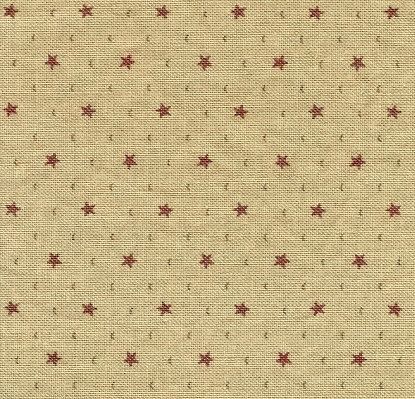 A balance between clarity and primitive style is strived for each time a new pattern comes out. QUESTION: I'm not a big fan of reading text in a pattern; could you add more visuals? ANSWER: The early patterns didn't have many visuals. I am an avid reader and of course thought everyone else loved the same thing! I did find that not to be the case, so there are more visuals in my patterns now. Look for even more in the future. Oh, there will still be the story at the top, and yes, I will continue to write the words but now you will have more drawings. And, I am always available if you need help! QUESTION: How do you come up with the fabric requirements for your patterns? ANSWER: LOL, that question always makes me smile. I'm not the precise kinda gal. Every quilt is usually so scrappy that it's so difficult to get it exact, so I don't even try. I try to give a ball park amount. Most of us have a stash to rival, in dollars, the national debt. What I would like is that everyone choose their colors for the pattern they will be making and then see what "else" you might need to enhance or complete the amount you need. I LOVE running out of fabrics. It makes me THINK about what would go with what I'm making and use something different. Gramma didn't have what we have. She did the best she could. If a pattern calls for 1 1/2 yards of red........it should be a total of assorted reds. That could be 6 fat quarters. Your local quilt shop owners will be more than happy to help you...Aw, another excuse to visit your favorite place! QUESTION: How do you pick out the colors for your quilts? ANSWER: We all love CERTAIN colors and that's reflected in our homes. BUT, there are only 6 colors to choose from: Red, Blue, Yellow - the three primary colors and if you mix two of those primary colors together you get 3 secondary colors: Green, Orange, Purple. That's it! 6 colors is all you get ever. So, in answer to the question I try to use all of them. That's what scrappy quilts are and why they will always work. QUESTION: Your quilts always look so warm, What colors do you use to achieve that? ANSWER: One of the easiest ways to warm up a quilt is to take the WHITE out of it. White makes things crisp and new looking. White is also not a color, nor is black. It's also not the color you use, but the VALUE you use of that color. Try using fabrics that are more grayed down or even darker in color. You can achieve a richness in color, but a warmer look by darkening the value. QUESTION: How in the world do you get the plaids in your quilt to match? ANSWER: They don't! Why would they need to? If you are cutting a large square, only to cut it diagnoally twice to make 4 triangles, each piece will be different. And, if you cut them sorta crooked to begin with it's even better. That's part of the older look that I can achieve with my quilts. Perfect is certainly not in my vocabulary. I want an older looking, more g-whoppied quilt. When you look at an antique quilt, doesn't it scream - wear, tear and lots of love? Let go of the concept that everything needs to be perfect and have more fun. QUESTION: I get so frustrated because I can't get my corners to match or the star points to be perfect, what can I do? ANSWER: Sorry, you are talking to the wrong person. If a point is perfect and four or nine patch corners match exactly, remember, I'm the one that celebrates and has a hot fudge sundae! It's not something that really has to happen for me. I love making quilts and I love having fun......the two must go together! I love people that can relax and just let things happen. However, I do promise you that if I have a quilt that is absolutely perfect in every way, I'll still sleep under it. ANSWER Yes, I do travel when I can. I love speaking at quilt quild meetings and teaching classes. I have done so many times. If you are interested in me coming to your area, please let me know. Setting the tables are always fun for me. My nephew and his wife, from Las Vegas, couldn't be with us this year, so they sent the lovely flowers for the table. Every cupboard with a flat surface wasn't left out this year. My santa made me this wonderful cupboard to house my computer for the office in the sewing room. I'm just thrilled with it! these pictures are hanging in the sewing room office. Fun little primitive cards. My brother in law made me the frames. I painted them black and distressed them. Vivian Ritter from the Quilter's Newsletter Magazine was instrumental in having two of my quilts featured in their "Quilt it for Christmas" magazine. I am very proud to have been chosen for this honor. It was an added bonus that they each made the cover. If you missed either of these issues you can still purchase the pattern from the patterns page....ppl006 Cranbrook Christmas and ppl014 Prairie Christmas Star. Quilt Country Magazine from France did an article on me this fall, 2011. My friend Veronique writes for the magazine. Thanks Vero and Quilt Country Magazine. 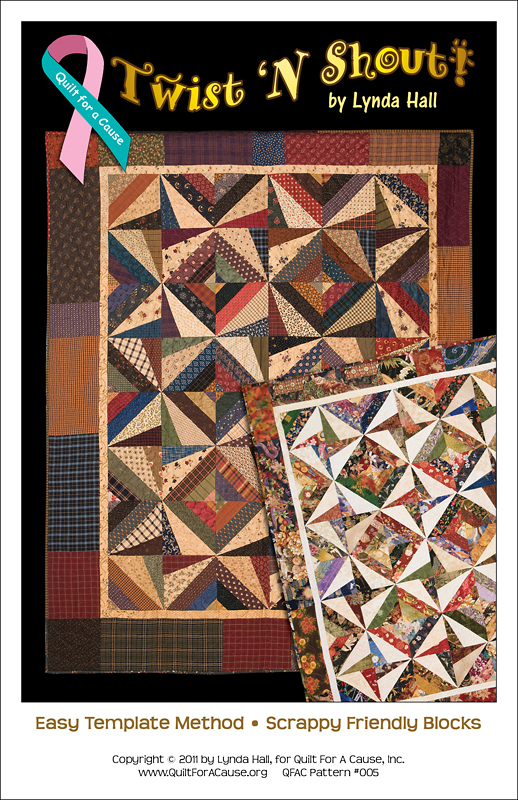 Primitives of the Midwest, a quilting retreat, is sponsored by Rita Briner and her gals from Quilter's Station in Lees Summit, Missouri. I've been honored to teach there since she started this gathering in 2004. This retreat is a 4 day event. Teachers are brought in from around the country and students from all over come too. Each year the gathering increases in size. I hope one day you'll join me there for 4 days of fun filled days of sewing, shopping, eating, sewing and so much more. As you can see, someone is always capturing a memory! Hope you can join us next year! I was invited to attend a retail show in Ft. Myers in January of this year, 2008. It was a very good show for everyone that attended. I took mom with me this time and we had a wonderful weekend together. After eating dinner at the crab shack at the hotel, we sat on our balcony, drinking wine and enjoying this wonderful view.